Cabasse Jersey MT32 review | What Hi-Fi? You’re getting a lot of box for the money with the Cabasse Jersey MT32 loudspeakers. Some rivals may have gone for a more ‘compact’ approach, but you’d struggle to apply that label to these sizeable floorstanders. 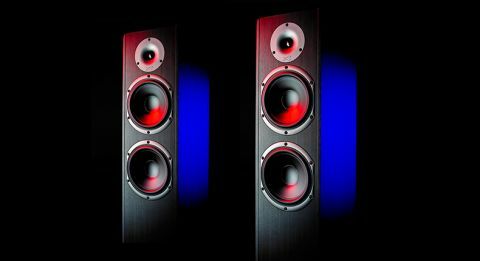 The ‘MT’ part stands for ‘midrange tweeter’ – that’s the DOM 37 tweeter, a design derived from Cabasse’s flagship La Sphere and L’Ocean speakers, which have six-figure price tags. These entry-level floorstanders don’t have the same level of fit and finish as their more expensive siblings, sadly. They’re well built, and available in ebony or walnut finishes, but there’s no denying they look a bit austere. That’s not necessarily a bad thing – just don’t expect them to add a luxury feel to your living room. Now, you’re going to need a fair bit of space. Not only are these fairly big and boxy – they aren’t too keen on walls. Put these speakers into a corner and you won’t get the good tonal balance that they otherwise enjoy. Give the Jersey MT32s space, though, and you’ll get space right back. They have an expansive sound that has no trouble filling a larger room. They can comfortably pump up the volume, too. If you’re after something to shake the house a bit, these fit the bill nicely. The presentation itself is a mixed bag. There’s a fair amount of detail across the frequency range, but the Q Acoustics Concept 40s, for example, demonstrate a more comprehensive and nuanced understanding of texture. Timing is another area where the Cabasses fall short of standards set by rivals: the Tannoy Revolution XT6Fs’ level of precision makes the Jersey MT32s seem a little sloppy. What we do like is how well the frequencies integrate. The drivers demonstrate a consistency of character. The sound is smooth and full-bodied, just like the Jerseys’ standmounted siblings, the Antigua MT32s. But unlike those speakers, there’s no real sense of enthusiasm. Where the standmounters had a sense of life, these floorstanders feel just a touch ponderous. Play something inherently bouncy – Taylor Swift’s Shake It Off, for example – and the performance feels a bit by the numbers, lacking any sense of energy. While there’s plenty of power on hand (as demonstrated by a quick blast of any Hans Zimmer), the Jersey MT32s seem rather ambivalent about exercising it. The result is a performance that feels unexciting. Rarely are we rapt with attention or animated, as we often are while listening. In fact, we occasionally find our attention wandering. And that somewhat unexciting presentation is a shame, because the Cabasse Jersey MT32s do quite a few things right. We appreciate the smooth presentation. We’re impressed by the sense of scale. And then there’s that appealing consistency across the frequency range. But we can’t get past that unexciting sound. We want to be entertained, and similarly priced rivals prove themselves to be significantly more capable.